Tiffs, tantrums and high-performance cars are just some of highlights in any Made in Chelsea episode. The show which follows the over-the-top lives and romances of rich 20 and 30-year olds in London’s richest borough is mainly watched for the cast’s lavish drama. However, we are more interested in their speedsters. From crashing race cars to refusing Bentleys, these socialites have us fawning over their luxurious motors. Relatively new to the Chelsea scene, Olivia Bentley was introduced to the show as the great-great-great granddaughter of the founder of Bentley Motors. Along with her sisters, Liv posed for Country Life magazine in a 1930s Bentley 8 litre. The 8 Litre was W.O. Bentley’s finest grand tourer and has since become a symbolic car for the company as it was both W.O.’s favourite Bentley and the last model he personally designed. Veteran Made in Chelsea star Ollie Locke first appeared on our screens full of tan and dressed head to toe in Union Jack print. Lover of all things Union Jack, Locke went so far as to have his 97 Jaguar XK8 wrapped in Union Jack colours. Locke’s beloved Jaguar, or as it’s better known, the Union Jag was built as a worthy successor to the veteran XJS and the XK-E coupes. The luxury cruiser is comprised of a 4.0-liter/290-horsepower DOHC engine and boasts gorgeous looks, communicative chassis and pampering accessories, all of which make for a rewarding ride. The XK8’s real wood and leather trim kept Locke in the premium lifestyle he is accustomed to. Sadly, Locke parted ways with his Union Jag in 2013. Locke flogged his XK8 on eBay to a patriotic green grocer in London. At the time of sale, the Union Jag had racked up 110,000 miles. Straight talking former MIC star Lucy Watson is famed for many things. Author, jewellery designer, restaurant owner and ambassador for PETA, Lucy sticks rigidly to a vegan lifestyle. Lucy is so devoted to veganism she went so far as to refuse a free Bentley because it had leather seats. Watson did a brief stint as a Bentley brand ambassador driving the GT Convertible. The Continental GT Speed Convertible has the profile of a high-performance Bentley coupe and is capable of 0-60mph in just 4 seconds, with a top speed of 204 miles per hour. Watson promptly moved away from her association with the luxury brand when she discovered how much leather was used in its interior. Ultimately, she said she made the decision because she “cared more about cows than cars”. A lover of the finer things in life, young millionaire Spencer Matthews enjoys racing cars, motor bikes and the most luxurious super cars. Recently he was spotted picking up his brand-new Aston Martin DB11. 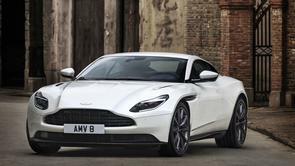 Its latest iteration is the most powerful DB production model in Aston Martin’s history and is worth over £161,000. Matthews’ new wheels boast 600bhp and 700Nm of torque, the ultimate car for thrill seekers like him. Matthews doesn’t just get his adrenaline fix from luxury supercars; he once joined famed Ginetta racer and British GT4 Champion Rick Parfitt Jr. for the inaugural Ginetta Festival at Rockingham Motor Speedway. Matthews took the £90,000 high performance Ginneta G40R racing car to the track but swiftly went to the gravel trap on his second lap. Luckily the G40R lived up to its reputation and was able to withstand the rigours of track driving, leaving the car with minimal damage. Matthews is a true petrol head; along with his love of fast cars, he is a biking enthusiast. Matthews is often seen cruising the streets of Chelsea in an array of powerful motorbikes. Moving on from his Harley Davidson, Matthews travels frequently in a Triumph Bonneville Bobber. The Bobber’s premium finish and detail rival all other in the Triumph line. Its exciting power delivery and exhaust note reach to 77 horsepower at 6,100 rpm, delivering a thrilling ride.